Chandigarh 28th November:--- Terming the bilateral trade to be the most promising factor and the most potent instrument for having better bilateral relations between India and Pakistan; and facilitate progress in actualizing their strategic partnership for the future, Suhaib Farooq, leader of the visiting 10 member delegation of Jhang Chamber of Commerce and Industry, Pakistan said, "There is a lot of trade potential with Pakistan. If trade takes a front seat, automatically, other issues shall get pushed to the back seat." Farooq was speaking during an interactive session organized by PHD Chamber of Commerce and Industry, here today. "Booming bilateral trade may well be the strongest pillar of Indo-Pak rapprochement so much so that it shall not only overtake the pace of general confidence-building but also have a substantial impact on each other's mutual perceptions," said Farooq.Farooq shared that there is lot of scope for trade in handicrafts, textiles, surgical items, sports goods, renewable energy sector and many more. "There should be maximum dissemination of information between the two countries that could lead to further increase in bilateral trade between the industrialists, businessmen and entrepreneurs of the two parties, with major thrust areas being education, infrastructure, food processing and energy", said Farooq.N S Aulakh, member, PHD Chamber of Commerce and Industry said, "With the thrust on enhancing trade between the two countries in the right direction, we should explore the possibilities of technology transfer between the two nations now. ""With the cross border trade especially being brought in for a noticeable transformation, it shall contribute to overall tranquility and peace in the area and shall well facilitate progress in the border areas," said Aulakh.Reiterating PHD Chamber's firm resolve to boost bilateral trade ties, Surjit Kaur, Deputy Director, PHD Chamber said, "PHD Chamber has been undertaking many initiatives aimed at confidence-building in trading communities on the either side of the border since its maiden show in 2005, the exclusively held Indo-Pak Expo, 2005. "Being a part of the integrated approach towards better trade ties, such interactions play the role of a catalyst", said Kaur, "And these efforts have to be continuous, rigorous and regular", stressed Sharma.The exchange between such delegations are a step further to provide a platform to the traders and masses of both the countries to understand each other better and dispel the presumptions in their minds for themselves, said Kaur. Visiting delegate, Waqas Farooq, lamenting the cross-border trade policy on both sides of the border said, "For traders and businessmen, trade is primary and we urge both the governments to open the trade between the two nations. "As per reports regards the total imports during the first quarter i.e. April 2012 - June 2012 was Rs 190.22 crore as compared to Rs 92.59 crore during the corresponding period of the last financial year. Similarly, export touched Rs 356.98 crore during the first quarter of the current financial year, while during the corresponding period of the previous financial year it was Rs 257.35 crore.As per a recently released US report, the Indo-Pak trade could jump to, well, 10 times the current amount. Removal of tariff and non-tariff barriers could result in an expansion of trade between the two countries from its current 2 to $2.5 billion to estimates ranging from $20 to $50 billion. Chandigarh 28th November:--- Dog has been referred to frequently as "man's best friend". Tri-city especially Chandigarh has a large population of Dog lovers who keep dog pets of varied breeds in their homes. The breeds which find place in the hearts and homes of this Dog loving clientele is varied; ranging from Rottweiler's, German Shepherds, Labradors to Spaniels and so on. However these pets are deprived of proper training, grooming and medical care. The pet supporting outlets which have mushroomed in the Tri-city claiming to cater to needs of pets are all owned and managed by 'non professionals', who are not experts of in the field. This obviously meant that no outlet, owned and handled by a professional, was so far in existence in the Tri-city area. Not anymore. This long felt vacuum in this arena has now been filled by arrival of a certified expert -- Sikander Singh who is the founder member of Panchkula Kennel Club and the Rottweiler Club of India. Sikander announced the launch of "Planet Pets", a one of its kind, state of the art Pet destination in the Tricity, at SCO 98, MDC, Sector 5, Panchkula. The launch event saw showcasing of rare dog breeds including the only 'Borzoi' dog – a Russian breed, in whole of Asia. The unique breed was the centre of attraction at the launch of 'Planet Pets '. Borzoi is a breed which was propagated by Tsars, the erstwhile Russian Royalty and is available mainly in Russia. Sikandar Singh who got his training in Thailand and is now one of Asia's top Rottweiler breeder, says, "I keep traveling all over the world to participate with my breeds in Dog shows and also to offer consultancy to clients. During my travels abroad, i had witnessed the smooth functioning of one stop shops for all pet needs and therefore i thought of pioneering this concept in North India starting from tri-city." Adds Sikander, "My motive is also to spread awareness about the need for overall upkeep of pets and for the same, i will be conducting free seminars and checkup camps for dogs and cats every month." Sikander is ably supported by Utkarsh Rathore a famous dog grooming professional, who has trained from Starwood Arts Dog Grooming School, Bangkok. Rathore gave a live demonstration of grooming, which is the USP of Planet Pets. It was informed that for dog grooming, in USA, American Kennel Club standards are used while India this is governed by Belgium based FCI (Federation Cynologique Internationale or World Canine Organization). Says Rathore, "Every breed has its standard as far as grooming and cut is concerned. Pet cuts are popular these days as these can give looks of Micky Mouse, Donut, Teddy Bear etc to your pet dogs. The other popular styles are more on the professional front and are known as Show Cuts. Planet Pet will be the only destination which will provide this kind of customized cuts for specific breeds." Various types of scissors are the most important items in the kit. The three pivotal scissors being: Straight Cut, Curved, and thinning. 'Planet Pets' as the name suggests will be a 360 degree solution provider for all pet needs. Apart from grooming it has a well equipped vet clinic run by top Veterinary Surgeons of North India and is geared not only for treatment & vaccination but also for surgery, cataract removal, dentistry, hospitalization and boarding. What's more, the outlet is fully stocked with pet needs like genuine Dog Foods with free dietary guidance & Dog accessories all provided at factory rates. Not only this, even puppies of various breeds are available at this pet outlet. Sikander Singh, who has been regularly organizing Dog Shows in Panchkula, has also started free home delivery & pick-up facility for dogs. Money will buy you a dog, but it won't buy the wag of its tail or his obedience or his love. So look after your pet with the support of "Planet Pets" and enjoy happy hours with your well trained and well groomed Pet. Chandigarh 28th November:--- The enforcement wing of Municipal Corporation Chandigarh today removed encroachments from shastri market and opposite Bus Stand, Sector 22 and outer area of the sector. During the drive 50 challans issued to the violators. The enforcement team removed and seized beds, chairs, generator, readymade garments, shoes, gas cylinders etc. total seven truck loads items were seized during the drive. The drive was carried peacefully under the supervision of Sunil Bhatia, Additional Commissioner and assisted by Kashmira Singh and other Sub Inspectors of Enforcement wing of Municipal Corporation. Chandigarh 28th November:--- Department of Biochemistry, PGIMER has been identified for the support for Level-1 category under the FIST (Fund for Improvement of Science & Technology Infrastructure) Program, 2013 by Department of Science & Technology, Government of India. DST has sanctioned funding for high end research instruments like GC-Mass Spectroscopy and Flow Cytometer, Installation of Networking and Computational Facility and Infrastructure development like BSL-3 facility to augment the teaching & research facilities in the department. This prestigious grant will be helpful in future advancement of the department as well as the institute for developing cutting-edge research facility aiming at excellence in teaching and translational research towards better patient care. Chandigarh 28th November:--- Gurukul Vidyapeeth Institute of Engineering & Technology is an institute with great social responsibility and the institute awarded with the best institute for excellence in innovation in Punjab . 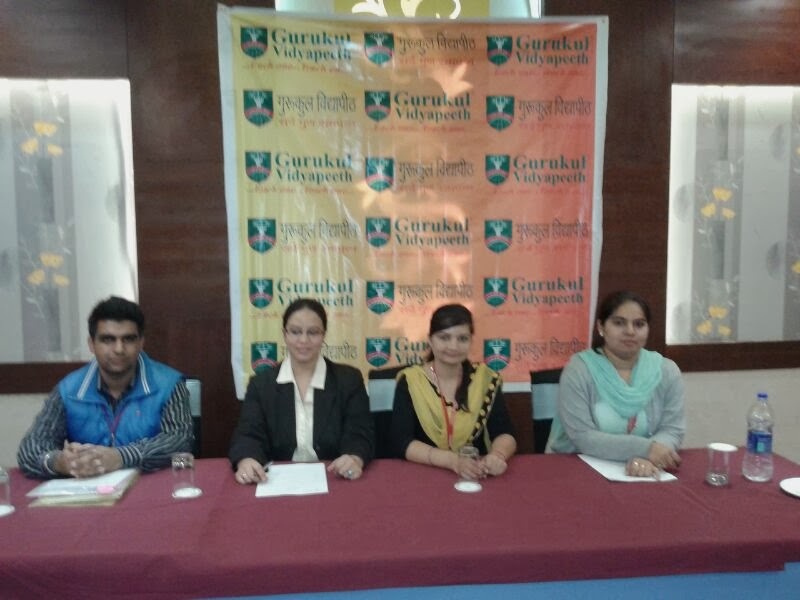 Gurukul Vidyapeeth announces admissions in January 2014 in all the courses in engineering and management besides the routine admission of July August. . This move is aimed at saving six valuable months of students who get their results late and therefore not able to get their admission in July 2013. This initiative will help students from the rural areas even and those who were not able to get the admissions due to the lack of knowledge or some financial constraints. Gurukul Vidyapeeth achieves another milestone by entering into an memorandum of understanding with Central Bank of India for providing education loan to the financial week students. Ms. Abhilasha Negi ,Manager Gurukul Vidyapeeth, said that this comes as the boon to the students who have missed therir admission due to any of the reason such as lack of knowledge , financial constraints or late results . Moreover he said this will also help the students who wish to change their stream, college or university for any reason. All such students will be admitted to the second semester in January session against vacant seats. He further said that in case of some engineering branches & other courses where certain prerequisite study is required such study will be offered during summer vacations( July –August) For B. Tech Courses students admitted in januvary in second semester will complete their second semester first and syllabus does not have mandatory condition to study first semester prior to the second. Therefore these students in the second semester will attend classes with the existing batches admitted in the July –August. They may be allowed to complete their first semester along with students of immediate lower batch. A separate batch will start for the student admitted during January from 3rd semester to complete there degree in minimum time duration. i.e four years as prescribed by AICTE. Er.Baljot Kaur, HOD of IT Deptt.Gurukul Vidyapeeth, Outreach informed about he Memorandum of Understanding entered by Gurukul Vidyapeeth Institute of Engineering & Technology with Central Bank of India for providing education loan to the students studying at Gurukul Vidyapeeth. He said that now students who are good in academic excellence and cannot continue their study due to financial constraints can nor pursue their study in one of the most prestigious institutes of Punjab. He said it will be the responsibility of the institute to provide the education loan to the students to the tune of Rs. 3.75 lacs per student for the entire course. The institute will give an corporate guarantee on the Loan document of the student.